Yes, that’s supposed to be a feathery headband but maybe it’s not very successful. Never mind. I had fun playing!! Sometimes when I paint, I put on an old black-and-white movie and just doodle. I like painting along with old movies that I’ve seen a million times so that I don’t really pay attention. Before you know it, two hours are gone and a painting emerges! What is your preference? Silence? Music? TV? I'm just curious! 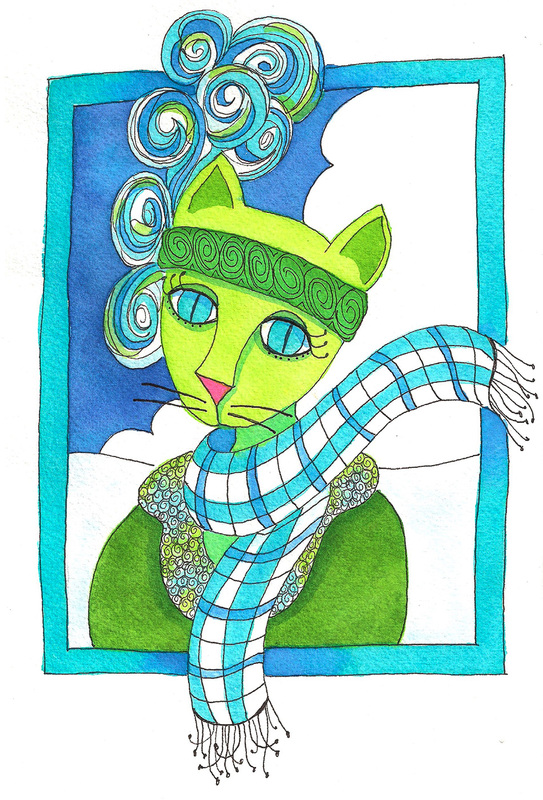 Lovely illustration of an adorable cat with a very creative headband that 'works' ~ love your style! This is gorgeous and creative, such pretty colours! Oh this is such a fair and beautiful cat lady! I love her! And my preference for entertainment when I paint is listening to an audio book. Oh she's lovely! I love her feather accents and the colors are wonderful! I guess I usually have silence when I paint, but I think music would work. With a movie I'd be too distracted. :) Love this colorful portrait! She is so beautiful and gentle. She feels like true lady :). I love doodling with cup of cacao and old the Twilight zone series. I adore your STYLE!! Just love your "kitties!"